Peninsula College Foundation is a nonprofit organization that expands access to education and supports exceptional programming at Peninsula College. Every year, because of your financial support, the Foundation helps Peninsula College serve thousands of students who become our community’s nurses, welders, medical assistants, web developers, university graduates and business leaders. We encourage individuals and community partners to be part of the life-changing events resulting from Foundation giving. PC Fact: Just over 72 percent of Peninsula College students were financial aid eligible, based on 2016-17 data and FAFSA applications. We cannot foresee the future needs of the College, but we can plan for them today. An unrestricted endowment is the most responsible way to do this. 100% of contributions to the “For PC, Forward” endowment will be protected forever, and earnings from the endowment will be used to support students and programs at Peninsula College. Our campaign goal is $1 million. Click here to download the Endowment Campaign Flyer. 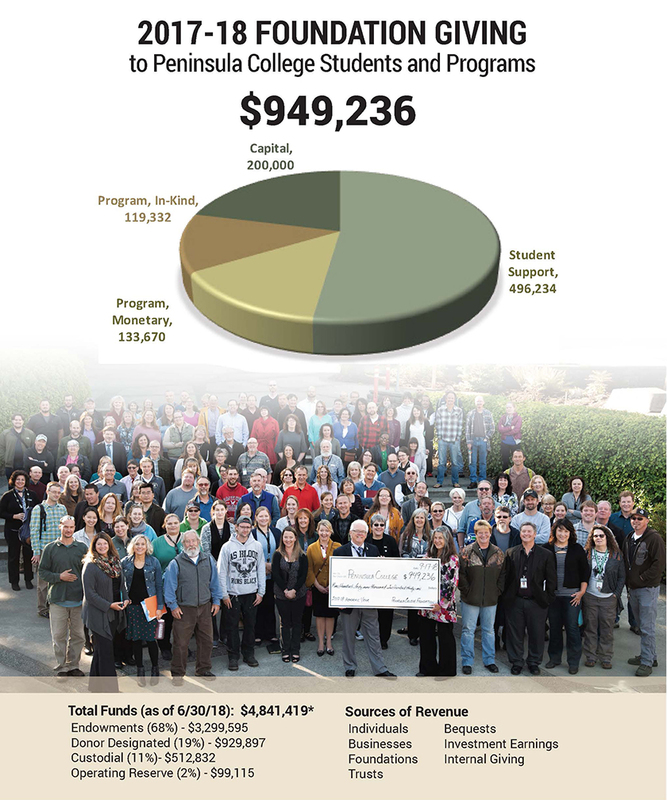 In the 2017-18 academic year, Peninsula College Foundation contributed just under a million dollars to students and programs at Peninsula College. Nearly $500,000 of this was direct aid to students, with a record 838 individual awards made. This included awards from the “Finish Line Fund,” which serves to aid students who are near degree or certificate completion but encounter unexpected financial problems that threaten to derail their education. For example, aid was provided to students to keep their power on, and to prevent homelessness. Program support totaled $253,002, and included funding for faculty professional develpment, research, visiting artists, and more. Through its participation in a complex and lengthy Historic Tax Credit process, the Foudation was able to provide another payment of $200,00 in capital reimbursement to the College for FF&E expenses that the College paid during the renovation of Building 202, its campus located at Fort Worden in Port Townsend. *2017-18 audited financial statements available here.